Pterosaurs seem to have been much heavier than anyone realized. In the late Cretaceous period, just before the demise of the dinosaurs, there lived reptiles as tall as a giraffe with wings as wide as a small airplane. They must have looked terrifying as they swooped and soared overhead at speeds approaching 60 miles per hour. 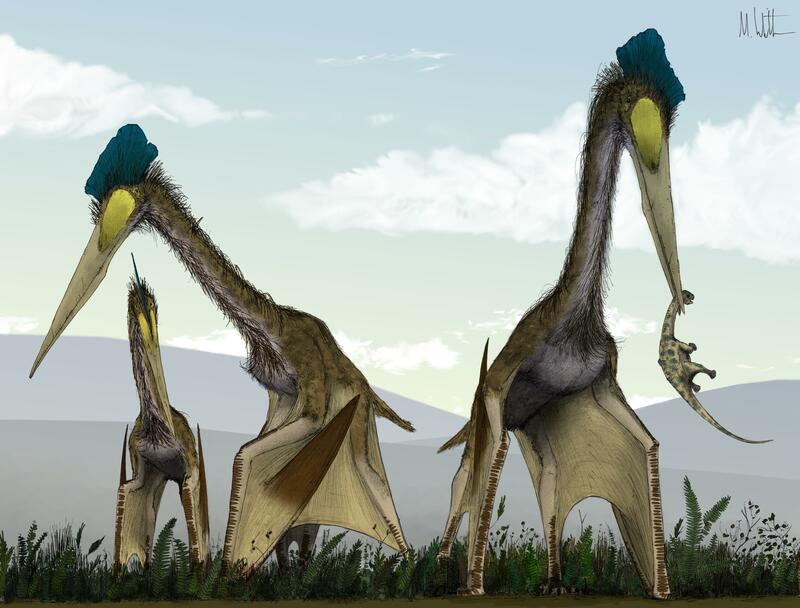 A quick Google search will tell you that these giant pterosaurs (which are often called dinosaurs but were actually part of the distinct pterosauria clade) were the largest flying beasts ever to inhabit the planet. But when paleontologist Donald Henderson, curator of dinosaurs at Canada’s Royal Tyrrell Museum, saw a piece of art with an Arambourgiania philadelphiae next to a human and a Masai giraffe, his scientific Spidey sense tingled. It’s an extraordinary image any way you shake it, made more extraordinary still if you consider that one mass estimate pegged the similarly sized pterosaur Quetzalcoatlus northropi at just 150 pounds, whereas an adult giraffe weighs about 3,500 pounds. There’s no way an animal that big could weigh so little, he thought, and there was very little chance it could fly. This illustration by Mark Witton shows the size of a 'Arambourgiania philadelphiae' compared with a human and a giraffe. The pterosaur's wingspan is 33 feet (art by Mark Witton). Henderson, who’s a fan of using art as a launch point for science, set off to make his own mass estimates for the species. He’s a math and physics guy, and he proved the modeling techniques on living birds. His conclusion: Quetzalcoatlus weighed 1,200 pounds and could not have packed on enough muscle to support its weight in flight. It had probably evolved to become flightless, like an ostrich or emperor penguin. “The safest argument that needs the least amount of assumptions and special pleading is that it couldn’t fly, based on what we see on birds today,” Henderson recently told Inverse. A baby tyrannosaur is just a light snack for a giant azhdarchid (art by Mark Witton). Witton’s own mass estimate puts the largest pterosaurs at about 550 pounds. Their tiny torsos, hollow bones, and interior air sacs allowed them to weigh so little even as they stood over 16 feet tall, he says. If you ask him, every line of evidence points to giant pterosaurs that could fly quite well. “All the ducks line up in a row, and it’s actually far more complicated for us to think of a reason why they’re not flying,” he says. It seems that one of the two scientists must be wrong. But what if they’re both right? What if these giants really were weighty behemoths who could take to the skies in spite of their size? A mid-size 'Quetzalcoatlus' could probably soar for hours. The biggest ones may have spent more time grounded (art by Mark Witton). If there’s a bridge between the positions of Henderson and Witton, it is embodied in Michael Habib, a professor at the University of Southern California and an expert in the biomechanics of pterosaur flight. He co-wrote the paper with Witton refuting Henderson’s claim that the giant pterosaurs must have weighed 1,200 pounds, but today he’s working with Henderson to develop an updated mass estimate based off an updated skeletal reconstruction for Quetzalcoatlus. Their work is still in process, but preliminary results have Habib convinced that the animal weighed quite a lot more than he and Witton estimated previously, even if they didn’t quite reach the mass from Henderson’s earlier work. But he still thinks they could fly. “Probably the biggest ones still could,” he tells Inverse. Habib is bullish on giant pterosaur flight. He’s made the case in the past that the giant pterosaurs of the azhdarchid family could cover 10,000 miles in a single trip by soaring on thermals and burning reserves of fat. He’s also developed a model for pterosaur takeoff that sees the beast use all four limbs, like a bat, to launch into the air. This idea, which has widespread acceptance, helps explain how pterosaurs got so much bigger than birds without losing their flight. But Habib’s idea about how the biggest pterosaurs lived and flew are changing, thanks in part to his recent work with Henderson. There’s already good evidence that large pterosaurs were mostly terrestrial, stalking prey on land like an enormous stork and gobbling up morsels as large as a small human in one bite. That’s an idea that’s been put forward mostly by Witton and fellow pterosaur researcher Darren Naish. There’s also evidence that pterosaurs flew immediately upon hatching — and they would have needed to since their parents likely didn’t stick around to protect them, and the Cretaceous landscape was full of hungry, carnivorous giants looking for an easy meal. An azhdarchid on the ground might have been more terrifying than an azhdarchid in flight (art by Mark Witton). So what if pterosaurs started out flying quite a lot but did so less and less as they outgrew competing predators and with rising energetic costs for getting air-bound? The very largest may have flown very little, perhaps only to cover a short distance to check out new hunting grounds now and again. Or maybe the biggest ones gave up flying altogether towards the end of their lives once they were firmly installed as the apex predators of the landscape. That’s a vision of pterosaurs that Habib is coming around to — potentially flightless for a small portion of their life, but certainly not flightless as an entire life strategy. Fossils are rare for these winged giants, but the bones we have just don’t point in that direction. The bones and their components scale up from smaller azhdarchids in the way that you would predict if they were still using their forelimbs as a flying apparatus. It’s the same pattern you see when you compare flighted birds of different sizes — a pattern that’s broken when you include the secondarily flightless ones, who show a variety of different body plans. Nothing close to a complete skeleton has been found for these azhdarchid giants. What we think we know about them is based on fragmentary evidence — a wing bone here, a vertebra there, a partial skull over there — extrapolated upon using the example of smaller members of the same family, which are well known. And yet this small collection of bones is the launching pad for some truly amazing science, from which we can imagine a giraffe with wings taking flight.